Star Wars creator George Lucas wants to build a a billion-dollar museum focused on art that tells stories, and he’s finally found a home for it in Los Angeles, not far from his alma mater USC. The Lucas Museum of Narrative Art will be located near Exposition Park, near the Los Angeles Coliseum, where currently there are parking lots, and is designed by Ma Yansong of MAD Architects, with a design that evokes a sleek, spaceship-like shape. Inside there will be 265,000–275,000 square feet of space, with nearly 100,000 square feet for galleries. Parking will be created underground for up to 1800 vehicles. Originally Lucas had looked to Chicago, and later San Francisco’s Treasure Island, but L.A. won out. 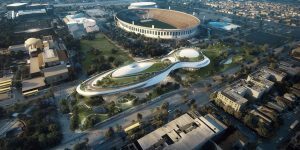 “After extensive due diligence and deliberation, the Board of Directors of the Lucas Museum of Narrative Art is pleased to announce plans to build the museum in Exposition Park in Los Angeles. We have been humbled by the overwhelmingly positive support we received from both San Francisco and Los Angeles during our selection process. Settling on a location proved to be an extremely difficult decision precisely because of the desirability of both sites and cities. The board wishes to extend a special thanks to Mayor Ed Lee and the San Francisco Board of Supervisors for their tremendous efforts and engagement. While each location offers many unique and wonderful attributes, South Los Angeles’s Promise Zone best positions the museum to have the greatest impact on the broader community, fulfilling our goal of inspiring, engaging and educating a broad and diverse visitorship. Exposition Park is a magnet for the region and accessible from all parts of the city. As a museum uniquely focused on narrative art, we look forward to becoming part of a dynamic museum community, surrounded by more than 100 elementary and high schools, one of the country’s leading universities as well as three other world-class museums. It seems that George Lucas is finally ready to give it up and go back to making films like he used to, like he’s been saying for years. Looks like ol’ George has a sense of humor about some things…after trying to build a state of the art movie studio on land he owns in Marin County, CA near San Francisco, for the last 25 years but being blocked by his rich neighbors that don’t want a studio near them, George Lucas put up his hands as if to give up and say, “Have it your way.” But since the local homeowners association seem to have no problem with residential subdivisions, Lucas has a new plan – to create lots of affordable housing for either low-income families or seniors living on small, fixed incomes. And he’s accelerating the process by providing all the survey information done for the studio plan. It remains to be seen if the homeowners association tries to come up with an objection to the new plan that doesn’t make them look bad. The sixth of the Blu-ray releases that comprised Warner Bros. Sept. 7th release date is THX 1138, George Lucas’ original SF film based on his USC student short film.